Important: All agreements that are paid with either a Purchase Order or P-Card will need to be processed through Purchasing Services. P-card payment related contracts should be sent to pcard@psu.edu with the subject line of Contract/Agreement Review for P-Card Transaction. This Contract Cover Sheet is a fill and print form located on the Risk Management Office website found under the Contract Information tab. This form should be used if 1) you have a contract that needs an authorized signature on behalf of the University or 2) you are seeking a review of the document by the Risk Management Office. The cover sheet must be completed and sent along with the contract and submitted to Risk Management by ONE following methods: email, fax, campus mail or US mail. Due to the processing procedure for contracts we ask that you do not email the forms directly to an individual in the Risk Management Office. You will need to complete the cover sheet prior to submitting your contract to Risk Management. Contract Service/Performance Date – If applicable, enter the service date, performance date or contract start date. Name of Vendor/Other Party – The company or individual that the University entering into the contract with. Mailing Address for Vendor/Other Party - Enter the complete address if the contract requires the University to issue a certificate of insurance. The address does not need to be completed if a certificate is not required. Certificate of Insurance Check Box – Mark this area if the University needs to supply a certificate of insurance to the Vendor/Other Party. Brief Description/Special Notes – Enter information pertaining to the contract such as: what is the contract for, who will be attending, is this a renewal; is the contract needed back by a certain date, and/or any special routing instructions. This information is critically important to assist the Contract Reviewer and Assistant Treasurer. Ag- Cooperative Extension Only – This section eliminates the need for the Ag Extension checklist. Please mark if the event is sponsored by the University and if an employee will be present and in charge of the event. Option 1: Signature Requested – If your College/Admin Area/Campus is requesting the contract be signed by an authorized signatory for the University then check Option 1. By checking Option 1 the Contract Requester affirms that on behalf of their department the contract and any terms/financial obligations have been read. It is the responsibility of the PSU Initiating Department upon receipt of the signed contract to forward to the Vendor/Other Party. This is NOT done by the Assistant Treasurer’s office. If any changes were made to the contract by the University then the Contract Requester must verify when they get the signed copy back from the Vendor/Other party that any changes were accepted and no additional edits were made. If this is not the case the Contract Requester must contact the Risk Management Office and not the Assistant Treasurer that signed the contract. Option 2: Review Only – If your College/Admin Area/Campus is requesting the contract only be reviewed by the Risk Management Office then check Option 2. The contract will not be sent for signature. Any feedback will be emailed to the Contract Requester. Initiating Unit – Enter your College, Admin Area or Campus. Contract Requester: Name - Enter the name of the person completing the form. Contract Requester: Email - Enter the email address of the person completing the form. Contract Requester: Phone Number - Enter the phone number (including the area code) of the person completing the form. Contract Requester: Mailing Address - Enter the campus or mailing address of the Contract Requester. The signed contract will be returned to this address, unless it has been emailed. 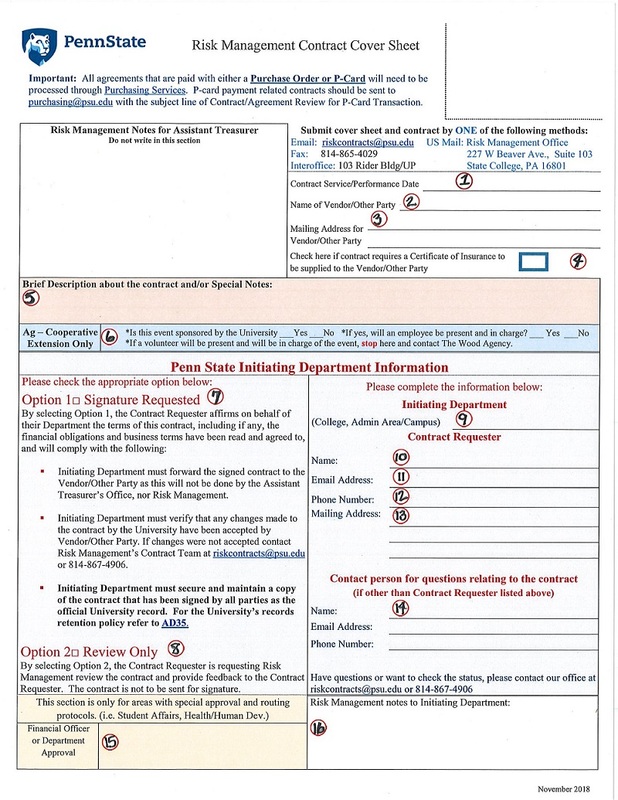 Contact Person: Enter the name, email and phone number of the Penn State employee (if someone other than the Contract Requester) who would be able to answer questions regarding the contract. Financial Office or Department Approval – This section is only to be completed by the Departments that have special protocol in place for contract processing. Risk Management Notes to Initiating Department – The Risk Management reviewer may have special comments for the Contract Requester regarding the contract. Please do not write in this section. Remember: only submit your contract once and not through multiple methods (e.g. fax and email). Multiple submissions could result in a delay in your contract being processed. What happens to your document after it is submitted? The contract is printed and logged into our contract tracking system and assigned to one of the contract reviewers in the office based on the type of contract. Click here for the Risk Management Office Contract Signature Approval Process Flowchart. What do I do after I receive the signed contract back from the Assistant Treasurer’s Office? The Initiating Department is responsible to forward the signed contract to the Vendor/Other Party. Please remove the cover sheet prior to sending contract to the Vendor/Other Party. This is an internal form only. When the Initiating Department receives the signed contract back from the Vendor/Other Party they must verify that any changes made to the contract by the University have been accepted by Vendor/Other Party. If changes were not accepted they must contact Risk Management’s Contract Team at riskcontracts@psu.edu or 814-867-4906. Initiating Department must secure and maintain a copy of the contract that has been signed by all parties as the official University record. For the University’s records retention policy refer to AD35.